If this baby had been a girl we were going to name her Jane. Jane Grace, after my great grandmother Grace Angeline Walker Knapp, of whom a gorgeous wedding photo hangs on the family tree in my living room. Also, after we chose it my mom discovered we have a whole mess of Janes up in the family tree further back, so apparently it's also a family name. But mostly we both just liked it. We didn't have to discuss it or fight about it. She was just...Jane. And then she was a he. Once upon a time (like a month ago) Aaron and I got our hands on the single season of Firefly on DVD and watched it and fell in love with the series. And hey! There's a man called Jayne! 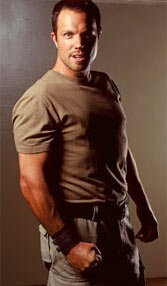 Jayne Cobb in Firefly is...very manly. And sort of a meathead. And he has an entire episode devoted to him about the town he thought was filled with enemies but it turns out he's a local folk hero akin to Robin Hood and there's a song about him and his awesomeness and it's all very funny. In any event, Aaron and I were like, "Well...maybe we can still name this baby Jayne..."
Except then I remembered that the son I already have loves my 4-inch heels and has made screaming like a girl an art form. And that basically no one else has ever seen or heard of Firefly and knows that a man named Jayne could be a really manly person. And also we're both skinny and pale and our boys have almost no chance of being taller than six feet and weighing more than 160 (ok, 150). A short, pale, skinny white boy who likes his mama's shoes could totally be named Jayne and still turn out ok, right? No!! Oh heavens no. I would die. When this post popped up in my reader I was thinking "What about this post merited a picture of Jayne from Firefly?" And then I read the first sentence and started laughing. Well played. Love me some Firelfy..my favorite episode is Janestown!! I say Jayne can work for a boy! LOVE Firefly!! LOVE Jayne!! And that is the BEST episode! Great post!! I'd say: go with whatever name you want and think of how it will affect your child. Kids can be very cruel in school so if you're having second thoughts... Don't go for it. But it's your choice and ultimately whatever we may say is just a third-party opinion. I LOVE the Firefly show!! Having watched Firefly (amazing show; I totally recommend Joss Whedon's Doll House, too! ), I totally love the name and the hero of Canton. The nice thing about naming a boy Jayne is that he can always go by Jay, if he wants to sound more "manly". If you add in a hyper-masculine middle name, that night help, too! But that's just me; I love "gender neutral" names like Alex and Jamie. So funny!! The gloves come off when we start naming too. You are darling and I'm so glad to have met you in person. AHHH I love me some Adam Baldwin. You could go with "Canton." =) And I have crocheted a Jayne hat, so that puts me in a special category of nerd.